Before you can take a picture, you need to know where the button is! It will look a little different on different phones, but it is usually a fairly large and round button on the screen. Depending on your particular phone and settings, you may also be able to use a physical button on the side of your phone. Before taking any picture, be sure to clean the lens. A dirty lens ruins the picture, and since it’s always in our pockets, it’s almost always dirty! Lens cloth, or micro fiber is best, but these lenses are pretty hearty – a corner of a tshirt will do the trick. Touch the screen to adjust focus and exposure point, you will see a square outline. Switch between rear and front camera lenses. The front lens lets you take a picture of yourself. Zoom in or Out with the slider, or pinch and zoom with two fingers. We advise against zoom however, since this is not a real zoom, it’s just magnification. You’re better off cropping the photo afterwards. Make sure to explore the menu on your camera. You may not see it right away, you may need to slide it out from its hiding place. Or you can touch the Menu button to make it appear. The first menu item is the gear for settings. On an iPhone that will be on the main phone menu settings under camera. 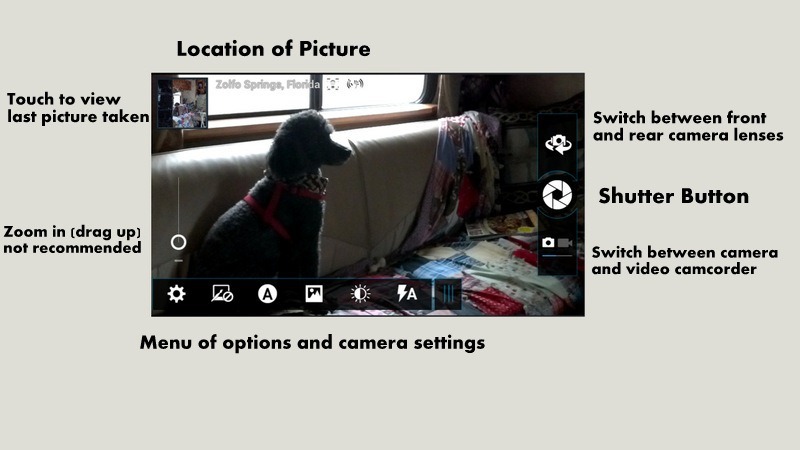 On my Droid Razr, the gear menu is where I find the option to turn on geotagging, which means the photo location will be stored with the photo. This is also where I can specify a clicking sound when I take a picture … or not. Turning the sound off can make it easier to take candid photos! Next comes Effects like black and white, or sepia. I never use these because I think they are better applied after the fact. Next comes scene settings – these can be very effective and I recommend that you try them all. For example, sunset mode can greatly enhance a sunset picture. Just be sure to set it back to Auto before you take the next picture that isn’t a sunset! Panorama is on the 4th option. It’s also available on the iPhone. Just turn it on, then get ready to pan your camera across a wide scene. Touch the shutter button and start panning. The camera will take multiple pictures as you pan. When it’s done, it will automatically stitch the photos together into one. Timer is also available on this menu, so you can set your phone on a rock, turn it on with a 30 second delay and touch the shutter button. Gather your group and the picture will be taken after the delay time. For iPhones, you need to download a separate app for a camera timer. HDR is a very special photographic feature. It actually takes 3 pictures with 3 different exposures, then it puts them together so both the bright sky and the dark shadows get exposed correctly and your photo is very rich. In the iPhone, HDR is a simple On / Off button on the camera screen. On Android phones you can download an HDR app. The link will show you all the HDR Apps, we haven’t used them enough to recommend one. 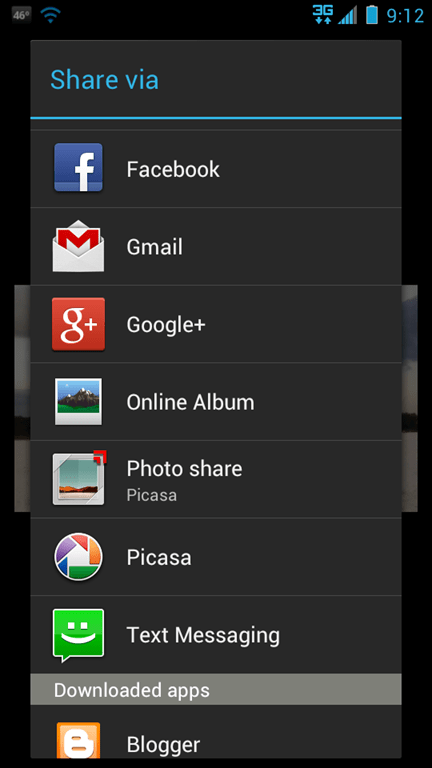 If you have Google+ installed, there is an option to automatically upload every picture taken by your phone. It will go to a special, private, space on Google+ Photos called ‘Instant Uploads.’ To see if that is turned on, open your Google+ App and touch menu, then settings. Where else do you want these pictures? You do not want your only copy of these pictures to be the ones on your phone! a. You can upload them to photo sharing websites like Google+/Picasa Web Albums, Flickr, Facebook, SmugMug etc. This can even be done automatically as in the case of google+ mentioned above. You upload by using the Share technique. After they’ve been copied to at least one place other than your camera, do you delete them from your camera? a. Yes: this would be treating your phone like any other camera, keeping it’s photo memory clear. When you want to show someone a picture using your phone, you can show them the copy on Google+/Picasa Web Albums or Flickr or Facebook etc. b. No: this will enable you to show friends any photo taken with your phone, even if you don’t have a good Internet connection. BUT, you will clutter your phone this way as hundreds of photos collect. c. Delete most of them: You could choose to delete most of the pictures from your phone, but leave the ones you know you want to be able to show at any time, anywhere. Android: from Gallery, open your camera roll. Touch your menu button and choose Select multiple – you should now see little checkboxes on each photo. Touching the photo will put a checkmark in the box. When you’ve selected all photos you want to delete, tap menu and choose Delete. iPhone/iPad: Open your photos app and touch Edit. Now when you touch each photo it will show a checkmark that it is selected. Notice at the top of the screen you have the choice to share or Delete (trash). Published by MrsGeek, in Blog. 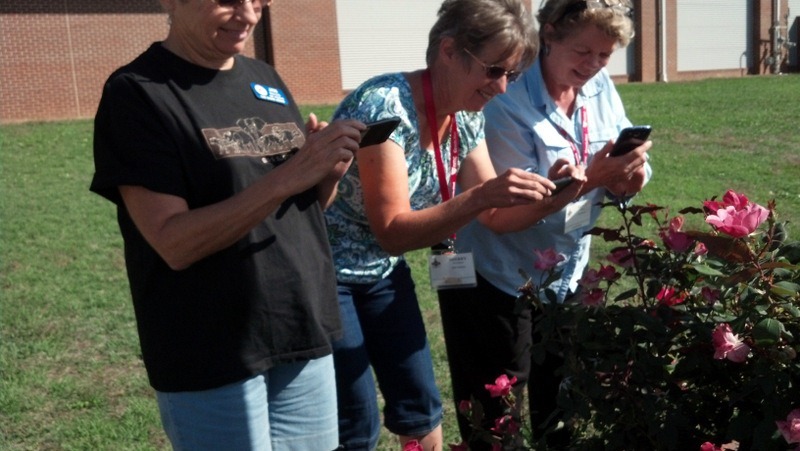 Tagged with smartphone cameras. I have tried to delete photos from my iphone but don’t seem to have the same screen as you note. I can “edit” and then touch each photo, but my choices are “share” or “add to” on the bottom and “cancel” on the top. There is no “delete” anywhere on my screen. Somehow early on my experience with the iphone I inadvertently downloaded 1000’s of photos from my desktop to my iphone. I didn’t want to do this but now am stuck with photos that are 5-6 years old. Hah, what a high tech guy I am. No trashcan, no delete…. baffled! When the 1000’s of photos were accidentally downloaded on the smartphone, they were in Albums. It seems that all albums are not removable. I can delete those that were recently taken that are not in albums but are in the “photostream”. Go figure.